Peanut butter and banana are the main ingredients in this moist, dairy-free cake, but the crumb topping is the real star of the show. Made with roasted peanuts, brown sugar, and olive oil instead of butter, the topping is light, salty, crunchy, sweet, and addictive. Both batter and crumb have relatively few ingredients, and are simple to prepare. I’ve been baking a lot recently with banana for its ability to lend moisture to desserts while replacing sugar and fat; see my recipes for banana brownies, chocolate banana pecan bread, and banana hazelnut blondies. 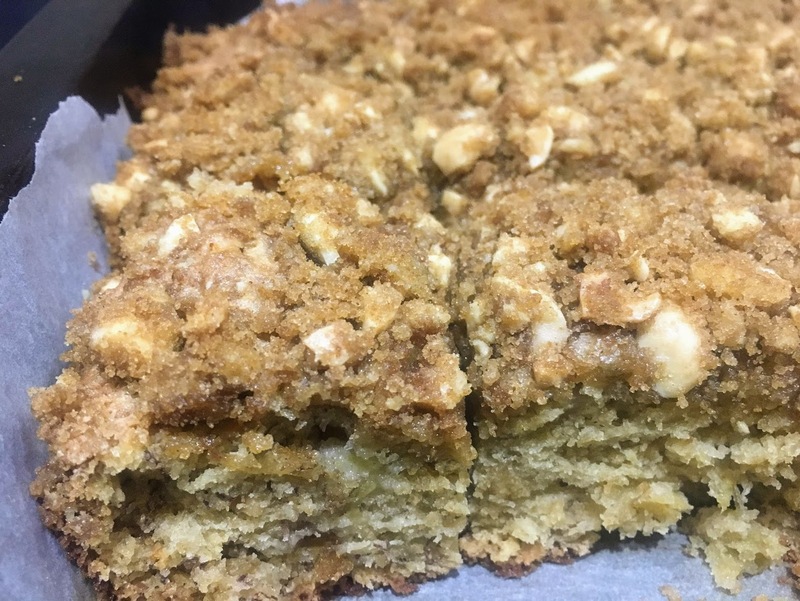 Note: If you have a peanut allergy, or want to try something a little different, substitute tahini for the peanut butter in the batter, and sesame seeds or coconut for the peanuts in the crumb topping. Preheat oven to 350 degrees, and grease or line a 10 x 10 inch baking pan with parchment paper. In a small mixing bowl, prepare the crumb topping. Combine brown sugar, oil, peanuts, cinnamon, salt, and flour. Stir briefly with a spoon or fork so mixture comes together, and then mix with your fingers to create a chunky, crumbly texture. Set aside. In a large mixing bowl, prepare the batter: mash bananas, then stir in peanut butter and eggs until smooth. Mix in sugar. Add baking soda and salt, then stir in flour until just incorporated. Pour into prepared baking pan and sprinkle evenly with crumb topping. Bake for 35-40 minutes, until a fork, toothpick, or cake tester comes out clean or with only a few crumbs. Serve warm, or let cool completely and store in an airtight container at room temperature.